METHUEN – The Massachusetts Women Veterans’ Network named Methuen resident, Sara Payne Hayden the Woman’s Veteran of the Year at a special ceremony in the State House in Boston this month. It was a privilege to nominate her for this honor and according to Heidi Kruckenberg the coordinator for Women Veterans’ Network, naming Hayden “was a no brainer!” Wearing the 1944 uniform designed by the famous aviatrix Jacqueline Cochran, Hayden received her award in front of numerous veterans and dignitaries. 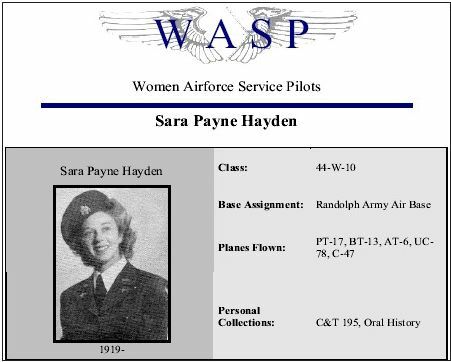 Sara Payne Hayden, WWII WASP (Women Airforce Service Pilots) was a member of the Class of 1944-10. They were an experimental, non-military group until they finally received veterans’ status in 1977 from the federal government. She went to Washington with the WASP’s to testify. This was the G.I.Bill Improvement Act of 1977 and it granted these women full military distinction. During WWII, these women were responsible for testing the aircraft that were shot up during the war and also for ferrying supplies. They were also used for target practice using live ammunition for gunnery trainees; they towed targets for ground to air anti-aircraft gunnery practice and targets for air-to-air gunnery practice. Her duty station was Randolph AFB, CIS. She was commissioned to the Air Force in July 1949. She served in active duty from August 1951-September 1953 as a Recruiting Officer. Sara Payne Hayden was born and raised in Granite Falls, NC in 1919. She was in a movie theatre in the early 1940’s when she saw a reel before the show advertising and recruiting for WASP. She knew instantly that was for her. She did not have the support of her family or friends and against all odds; she borrowed money and entered the WASP program at Avenger Field in Sweetwater, TX. She borrowed money to gain the necessary flight hours before her application and during these lessons many obstacles both financially and socially were overcome in order to complete her fight time. 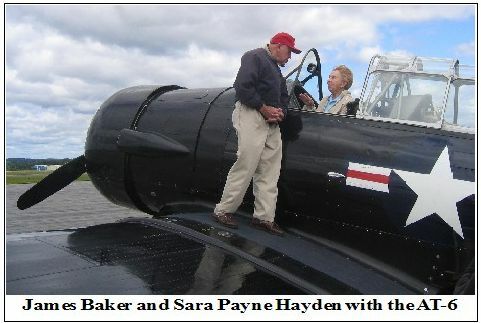 Sara Payne Hayden has a long history of service and the furtherance of military endeavors. She served as WASP Vice President 1975-1978 “Order of Fifinella” (the mascot designed by Walt Disney for WASP); and the Ways and Means Chair-person; Class Secretary 1965-1975; Military Veterans Affairs Chair, 1994-2007. For the past 15 years Sara has filled out application forms for WASP’s who have not received their discharge or families of WASP’s and have helped them with the requirements. She sends them to Randolph Field for processing and the issuance of the DD-214 form. 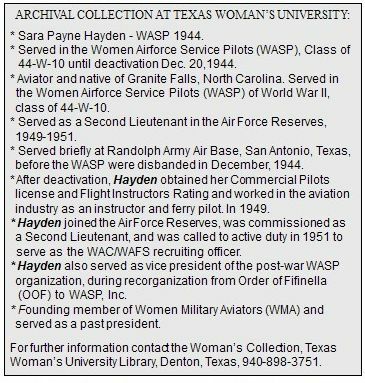 Hayden was Women Military Pilots, Inc. president from 1980-1983. The Clerk of the Corporation, 1978-present, Officer; WMA, Inc. is a Public Charity of the Commonwealth of Massachusetts, with IRS tax exempt status, whose purpose is to promote and preserve for historical, education and literary purposes the role of military women pilots, navigators and aircrew in the service of their country during times of war and peace. Hayden is a member of The Ninety-Nines, Inc. She has been a member since 1945 and has served as Treasurer and Secretary of the New England Section, on many Chapter and Section Committees, and current Legislative Chair. She received the 1994 New England Section Honor Award. Locally, Hayden is active in the Methuen Women’s Post 417 of the American Legion. She is the Past Commander, Life Member just receiving her 50 year, Post Adjutant, Finance Officer and the Boys’ State Chair. Boys’ State is an annual one week study of our democratic form of government sponsored by the American Legion. It is open to young men finishing their junior year of high school. Hayden interviews these young men after they have been approved by the high school principal. Since 2004, Hayden has assisted the families of five of the thirty-eight WASP’s killed on active duty who have been buried without a marker on their gravesite. Their memorial services were held in May of 2007 with their Veterans Administration markers in place. Hayden’s activities in the community are well known. They include speaking engagements for various groups especially schools. She was the WASP representative at the opening ceremony of the WWII exhibit at the JFK Museum; Color Guard on women’s day at the Viet Nam Moving Wall; and “In Defense of Hanscom” Conference on January 30, 1995. She has been an active contributor at the Woman’s Texas University archives. She was featured on MCTV (Methuen Community Television) on the series “Call to Serve” which works with the Veterans’ History Project at the Library of Congress. She is part of the permanent exhibit at the Women at Work Museum in Attleboro, Massachusetts where she was also part of the keynote address for the Women Who Fly program at the museum. Hayden is a pioneer in American military history. She broke through barriers that most can only imagine. 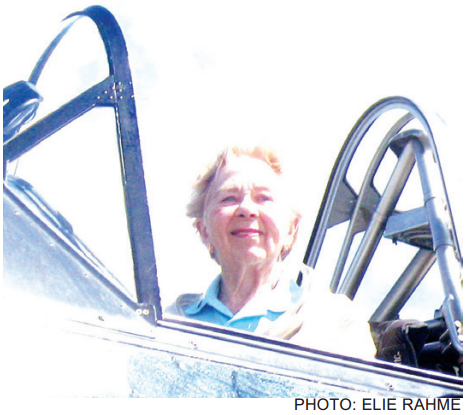 She trail-blazed through the skies and her work and sacrifices have made it easier for military women of today. A day doesn’t go by that Sara Payne Hayden doesn’t celebrate women’s role in the U.S. military. We thank you Sara Payne Hayden for your military service, for your undying loyalty to your country and your community, and we are honored to call you our Valley Patriot of the Month. You are truly a hero in our midst and the people of Methuen and our nation should recognize forever the sacrifices you have made to make life better for the rest of us who have reaped the benefits of your service and sacrifice.